Gracious is my best descriptor of Rain Dance Vineyards owners, Ken & Celia Austin. 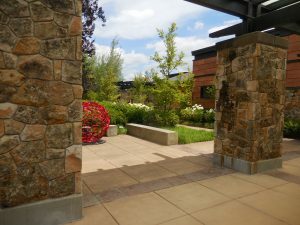 Having been the recipient of their genial hospitality, I highly recommend their high-scoring wines and the warmth of their eco-friendly Allison Inn & Spa in Newburg, Oregon. The resort’s lavish guestrooms are the perfect place to unwind, relax and indulge. Each room features a gas fireplace, private terrace or balcony, and best of all, a spa-like bathroom complete with a big white fluffy terry robe emblazoned with an A. The entire place is luxurious, warm and inviting. A stroll around the grounds reveals picturesque landscaping with rose archways, bushy herbs and yard art that will make you smile. In the morning, coffee on the expansive veranda with a good book creates a cozy island of serenity. The Austins’ ancestors started farming the Willamette Valley in 1859. Fifth-generation Ken Austin continues to farm 120 acres, of which 75 are under vine and closely monitored by a pack of prized llamas. They have one of the country’s premier llama ranches, having traveled extensively looking for the finest breeding stock resulting in national champions. They accumulated properties over the years and then cleared the poison oak, blackberries and some of the trees left over from a Christmas tree farm so the vineyards could be planted. And they had help with the poison oak and blackberries from an unlikely source – the llamas. Yep, those llamas helped clear the noxious weeds in exchange for their room and board. When we visited, they had just been shorn so their wool could be sold. They looked like large poodles with those goofy poodle cuts. But that’s because only certain areas have the best wool for warm and resilient blankets. The Austins are true stewards of the land. When developing new vineyards, they will walk it with their vineyard manager and talk about each tree and how it important or not it is to the land. Groves are left for deer to graze, part of their goal to keep the Chehalem Mountains sustainable. The deer actually seek out the llamas because they’ve found the llamas will protect them from most predators. Art collectors and supporters, Ken and Celia host an art show twice a year. The art show and their Rain Dance Vineyards tasting room also showcase Ken’s fine woodworking. 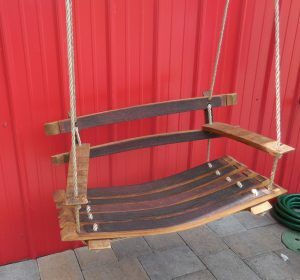 Here you can see some beautiful wood work from repurposed wood. A self-taught wood turner, Ken also studied furniture making at Oregon College of Arts and Craft. They are also collectors of restored cars that would make any motor head drool. On a tour of the Rain Dance Vineyards, we were treated to their well-balanced Riesling, Gewurztraminer and Chardonnay from an ice bucket on the tail gate of a 1955 Chevy Cameo that had been lovingly restored. The actual Rain Dance Vineyards were planted in 2009. Rain Dance has four estate vineyards in the Chehalem Mountains AVA. These sites are Low Impact Viticulture and Enology (LIVE) and Salmon Safe Certified. Other sustainable techniques used include dry farming, multiple thinning passes, cover crops and judicious pruning. All this attention to detail makes some pretty remarkable wines. They are made at a custom crush facility by Bryan Weil, also the winemaker for Alexana Winery in the Dundee Hills. Bryan earned a degree in enology and viticulture from Oregon State and then worked in vineyards and cellars of Domaine Serene, Hogue Cellars and Kim Crawford. 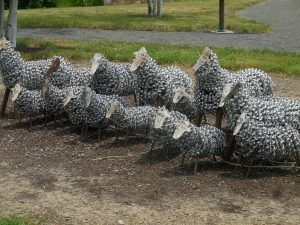 The Rain Dance Vineyard was originally a Christmas tree farm when Ken and Celia acquired it in 2009. 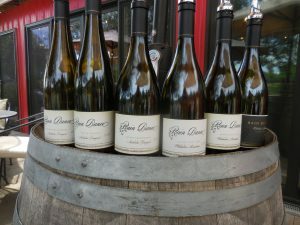 As they celebrated the grand opening of the Allison, they decided on a vineyard encircled by Douglas fir and oak trees. The Estate Pinot Noir and Reserve Pinot Noir are produced from this vineyard. The 2015 Estate Pinot Noir was very aromatic with lots of dark cherry earth and spice. It paired nicely with a salad of roast pork strawberries and Lorelei goat cheese. The limited production 2014 Reserve Pinot Noir is 100 percent Pommard – my very favorite Pinot clone – and saw a bit of new oak, but the short amount of aging didn’t hide the very fragrant nose. Well-balanced and beautiful. In 2014, the Nicholas Vineyard was acquired. This 40-acre vineyard is a mile or two east of the Rain Dance Vineyard. It was originally planted in 2001 and then planted again seven years later with Pinot Noir, Chardonnay, Riesling and Gewürztraminer. The Riesling was juicy with good acidity and citrus flavors. Not sweet but not real dry, chill it up and here’s a wine that would pair well will shrimp, scallops or crab. The Nicolas Vineyard Gewurz is from a cooler elevation and is barrel-fermented and aged in neutral oak. This, too, is very fragrant with crisp fruit flavors. Ditto on the shrimp, scallops or crab. The Nicolas Vineyard 2015 Estate Chardonnay was whole-cluster pressed and fermented at a relatively cool temperature. This brings out a depth of flavor that is full of citrus, apple pie and ripe pear. The oak is understated with only 25 percent new French. The lively acidity makes this a great wine to pair with seafood. Ditto on the shrimp, scallops or crab. The eye-catching tasting room has that tranquil feeling, a place where you’ll be greeted with that gracious hospitality. Cheers!